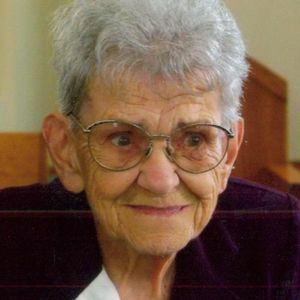 Vivian D. Penoske, age 93, of Beaver Dam, died on Tuesday, April 9, 2019 at Columbus Community Hospital. The visitation will be at Annunciation Catholic Church in Fox Lake on Thursday, April 11, 2019 from 4:00 p.m. to 6:00 p.m., with a Rosary to be read at 6:00 p.m., and on Friday, April 12, from 9:00 a.m. until 10:00 a.m. The Mass of Christian Burial will follow at the church on Friday at 10:00 a.m. with Fr. John J. Radetski officiating. Burial will be at Holy Angels Catholic Cemetery in West Bend. Vivian Dorothy Graff was born on November 5, 1925 in Beaver Dam, Wisconsin to George H. and Verdella (Immerfall) Graff. She was a 1944 graduate of Beaver Dam High School. On December 7, 1945, she was united in marriage with George Penoske. Vivian worked at Weyenberg Shoes for 15 years and at Specialty Cheese for 14 years. She was a former member of Holy Family in Reeseville where she was active in the Christian Mothers and Altar Society. Vivian later moved to Fox Lake and became a member of Annunciation Catholic Parish. She volunteered for many years at the Beaver Dam Senior Center, helping with BINGO, lunch and other duties. In her free time, Vivian enjoyed crocheting, embroidery, puzzles, and camping. Survivors are her son, Frederick (Brenda) Penoske of Fox Lake; step daughters, Sally Miescher of Reeseville, and Joanne (David) Zirbel of Lowell; 11 grandchildren; 21 great grandchildren; 21 great great grandchildren; nieces, nephews, other relatives and friends. She was preceded in death by her parents; husband, George in 1996; brother-in-law, Emil Schmid; step son, Eugene Penoske; daughter-in-law, Sheila Penoske; son-in-law, Fritz Miescher; and three grandchildren, George Miescher, Dan Zirbel and Bob Parr. Add your thoughts, prayers or a condolence to Vivian's guestbook.